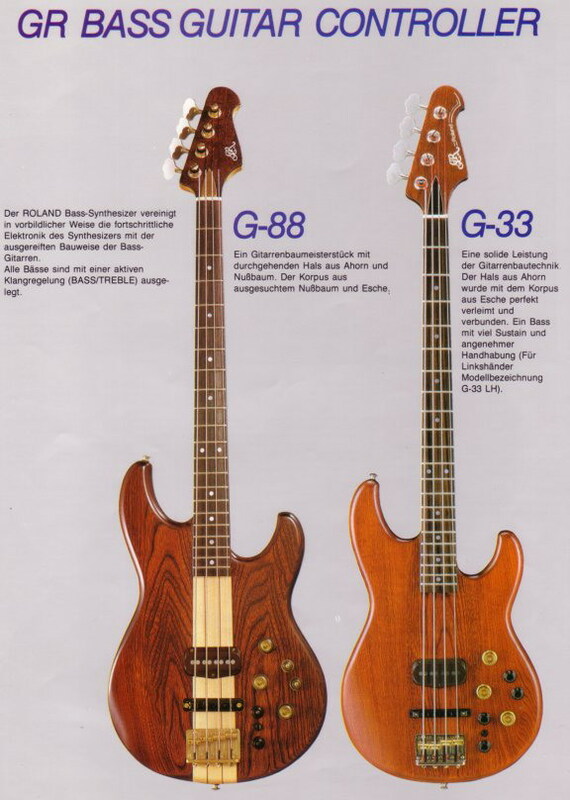 The Roland GR-33B is the bass guitar version of the GR-300. 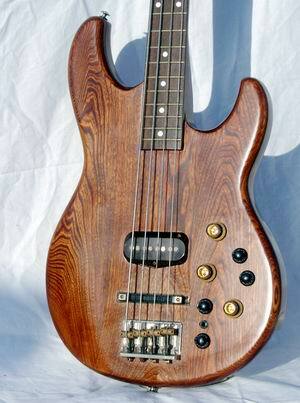 Some changes were made to meet the specific needs of bass players. Also, there is no hex fuzz circuit. The GR-33B also has two selectable envelopes, and a choice of VCF and/or VCA modulation. While the GR-300 has a -24 dB per octave filter, and the GR-100 has a -12 dB per octave filter, the GR-33B actually has both, with a switch to select -12 dB or -24 dB operation. Learn more about the design of the GR-33B -12/-24 dB per octave IR3109 filtering section on the GR-100 page. There is no pitch sweep like on the GR-300. The GR-33B has a very cool variable LFO delay. This delay follows the envelope generator. This means you can play a note and hear the LFO quickly or slowly swell in. Playing notes rapidly means that you will not hear the vibrato effect. 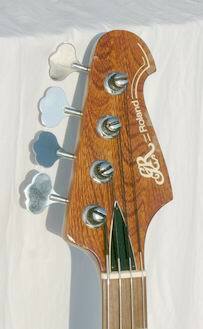 It is very expressive, and makes sense for the bass player that may not want constant vibrato. If you check out the Frankenstein demo, you will hear vibrato swelling in on the main line. I did not use the touch pads to activate the vibrato each time I played the phrase, but instead set a short delay so the vibrato would swell in on the longer quarter notes in the melody. . The GR-33B sounds very much like the GR-300. If you compare the block diagram for both synths, you will see that they are basically the same. 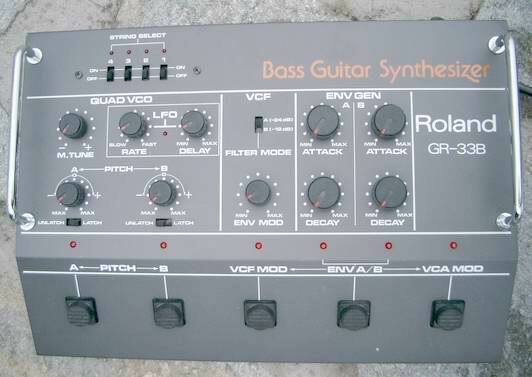 Likewise, the synth response time for the GR-33B is very fast, like the GR-300. I did a few timing checks when recording demos for the GR-33B, and the delay was in the range of 2 - 4 milliseconds. This is the kind of speed that a digital synth could only dream of. I would like to mention that I really wish the GR-33B provided access to the square wave output. Like the GR-300, the main output is an unusual ramp waveform. When the duet mode is engaged, you can hear a square wave and the ramp wave. The problem is the aggressiveness of the ramp wave. It is much more like a brass wave, than the buttery smooth sound of a classic Minimoog bass patch. You can filter the ramp wave to eliminate the aggressiveness, but the waveform becomes very dark with few harmonics. You can hear this sound in the VCF and VCA modulation demos below. The Frankenstein demo also shows off the aggressive sound of the GR-33B. Finally, the response of the GR-33B system has some uneven areas compared to the GR-300, which has flawless tracking. In particular, playing the low E and low A strings can confuse the synth tracking system. The problem does not seem noticeable with the D and G string. I spent an entire weekend testing my system before concluding that the GR-33B is pushing the limits of guitar synth technology with the low notes. Mark Smart, a serious musician and guitar synth genius reported to me that his main problems with tracking came from the lowest notes. And I was able to exchange emails with Pablo Leocata, another serious GR-33B user who reported similar playability. Depending on how you play, this could be unnoticeable, or an annoying inconvenience. My theory that this issue has to due with the different quality in sound from the open strings to the fretted strings.